When we approached longtime client, Unity of Houston, about developing an app for their ministry, they jumped at the chance! With such a large ministry, they needed a way to help keep members connected and informed. The new Unity App delivers on this request, and much more! The free app allows users to listen to or watch latest services and lessons. Previous services can be found in the Video and Audio Libraries. 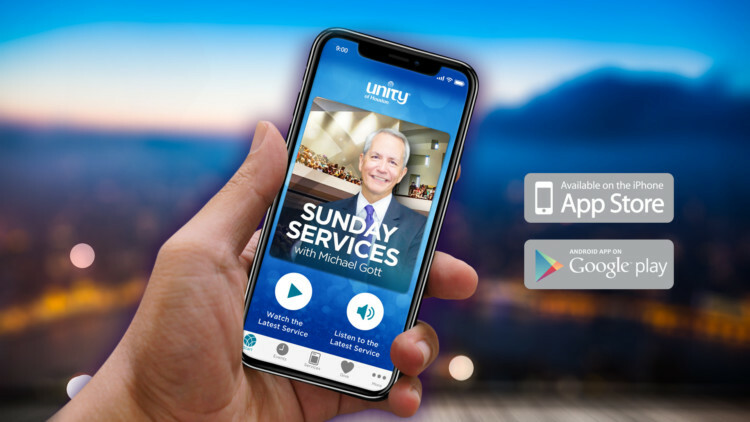 Never have to miss a Sunday Service again! The app, which pulls data directly from the Unity of Houston site, keeps an ever-evolving, ever-updating list of classes and events. Now members have info on everything from Sunday School topics to special guest speakers right at their fingertips. Cut down on waste and printing costs! Anyone with the Unity App can view the most recent church bulletin at any time! We can link the app directly to your current banking system to accept online donations. Unity of Houston wanted a way to connect with their members, and reach a younger demographic. But the new Unity App is so much more! It’s a way to reach new members, a moment of much needed inspiration for a hurting soul, resources for someone’s spiritual journey, and a tool to help grow a ministry, and build a community. Need a Custom Developed App?